The Super Halloween DJ for you home or office party! Devon Spears Events has raised the bar for Halloween entertainment in Nassau and Suffolk County. Combining quality entertainment, extravagant DJ set-ups, and unparalleled personalized service, Direct Sound offers a one-of-a- kind Nassau County DJ experience. Take a look around to find out what makes our Djs so great as well as helping you make the first steps in planning out your Nassau County Dj party the greatest event your family and friends ever attended. We understand the significance of this day in a Family’s life and the proud moment that this is for your family and friends. For the last 16 years, we have done Dj Events in All of Nassau County,s Venues and has been honored to be invited back by families and Friends. This may be the first event of its kind you have planned. You can benefit from having an experienced Nassau County DJ to help you in advance of your Event and avoid common pitfalls. With our Disc Jockeys you will have personal service from a coordinator and our event planning tools…. Control Your Music… We maintain a music play list! We include the most current and most popular songs that you and your family and friends expect. It is extremely important to have an understanding of what music is available to you and how it is chosen. This is your family’s party and you are the expert on what music you and your guests will enjoy. We play the best and most current songs from our library, which you can compile your play list on-line for your Nassau County Event. If you all want to party like we do than you all got to party like us. The dj also plays your favorite Halloween songs, such as The Doors’ “People Are Strange” and Michael Jackson’s “Thriller,” also a Back-soundtrack of creepy sound effects which includes knives being sharpened, thumping heartbeats, and howling winds(including thunder, screams, snarling monsters, and chainsaws–definitely not for the faint of heart). Add A TV For The DJ to p lay classic horror films in the background for your Halloween party (on mute, you don’t want the sound to be distracting) to get guests in the mood, such as Friday the 13th, The Exorcist, or, naturally, Halloween. For less frightening movies that still set the tone, try The Addams Family, Beetlejuice, or—the best feel-good Halloween flick ever—It’s the Great Pumpkin, Charlie Brown. Candy and loot bags. 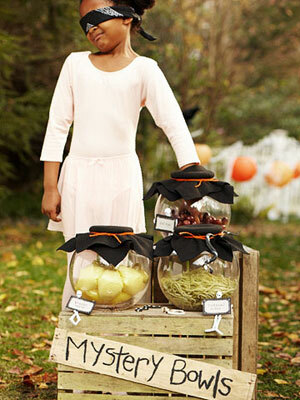 Set out glass jars loaded with different types of candies and mini scoops, and let guests fill their own goodie bags to take home, from gross gummy body parts (feet, ears, and eyeballs) to classics like Pixy Stix and Bazooka. Punch bowl. No Halloween party would be complete without a spooky punch. Serve one that’s blood-red, ghoulish green, putrid purple, orange, or black and use dry ice to create an eerie mist. Napkins, plates, utensils, and tablecloths. Keep a stash of these essentials in colors and patterns that match your scheme. 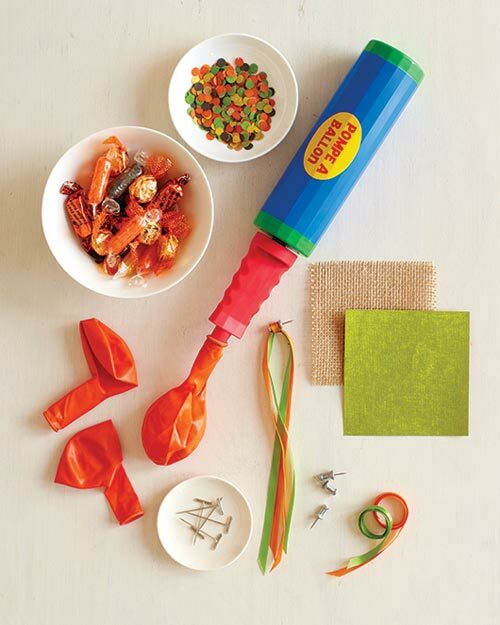 A festive covering will make your everyday tables party-ready in an instant. Serving dishes. Count your platters beforehand to make sure you have enough space for all your party treats. Make a list or label each dish with a Post-it note or masking tape to keep track of which food goes with which platter. Beverages and cups. If you’re serving alcoholic drinks, plan on three to four cocktails per guest for a two- to three-hour party. And don’t forget to include something alcohol-free and fun for the teetotalers and kids in your group. Make sure to have heatproof cups on hand if you’re serving anything hot, like mulled cider. Appetizers. Serve plenty of savory items to balance out all that Halloween sugar. For less stress, make as many items ahead of time as you can. Desserts. Cupcakes and cookies are easy for guests to eat and fun to decorate for Halloween (for example: cookies shaped like ghosts and cats and cupcakes topped with orange frosting or mini pumpkin candies). For even more holiday spirit, make pumpkin cupcakes and decorate them with candy corn. 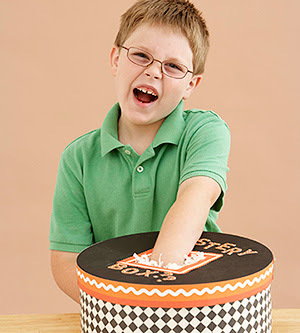 Or try using Halloween candy in creative ways: Serve a Twix cheesecake pie or make chocolate bark decorated with candy corn. Carved jack-o’-lanterns. Greet guests with a lineup of these lighted hosts on your stoop or porch. Pumpkins and decorative gourds. Display these in clusters around your home. 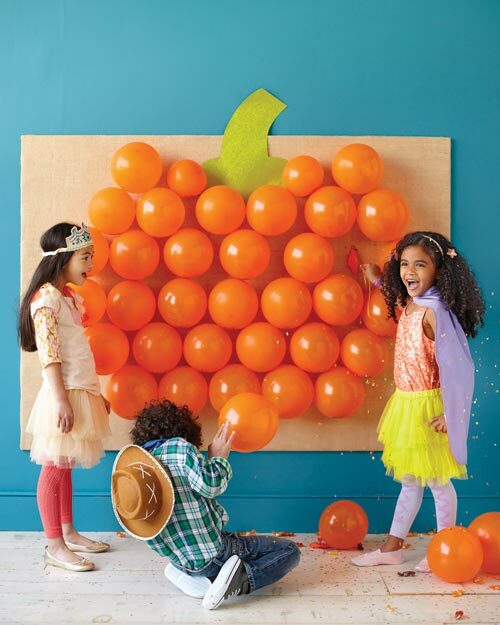 Try different ways of dressing up your pumpkins—spray them with metallic paint for a golden glow or use chalkboard paint to make faces or write messages (a great project for the kids). Fake cobwebs and spiders, paper bats, balloons, and other decorations. 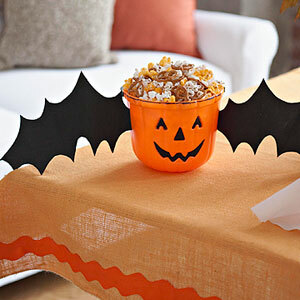 Hang cobwebs and spiders in the corners of your room, let bats and banners dangle from the ceiling, and go all-out with festive or frightening décor to create the right atmosphere. bags of bones, ghosts, and tombstones. Halloween is one holiday when it’s OK to be over-the-top. Candles. Scatter lots of votives throughout your party and group pillars of varying heights and sizes together. Display a candelabra for dramatic flair. Costume accessories. Whether you’re hosting a costume party or not, it’s always fun to have some extra dress-up items around. 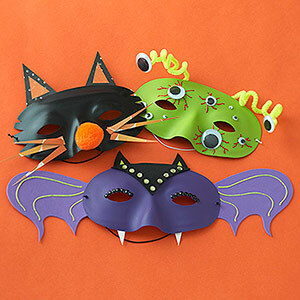 Set out some masks and wigs, plastic fangs, hats, a cape, a tiara, a feather boa—whatever suits your fancy—and let your guests get creative. Camera. Don’t forget to recharge your batteries and clear space on your memory card before your Halloween bash. Designate a friend or family member as the party photographer so you’ll have one less thing to worry about. 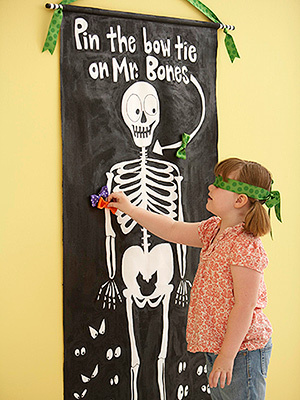 Pin the bow tie on the Skeleton-How fun! 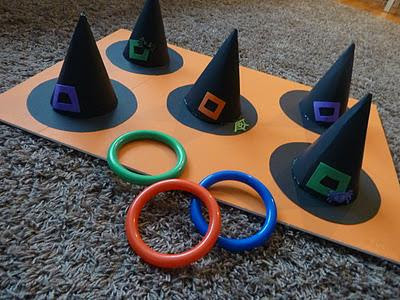 This Witch Hat Ring Toss looks like a lot of fun and easy to make! We did this cute balloon game last year and it was so much fun. We slipped candy into the balloons and then blew them up and attached to the box. We made a smaller version but this year I think I’ll make it a lot larger. Really a lot of fun! You could make a bat out of black balloons for a change. 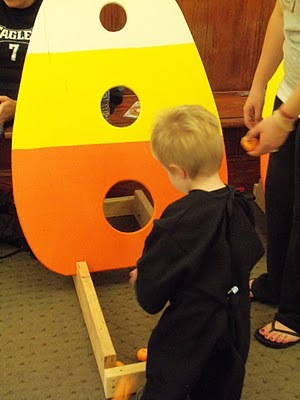 The kids will like this bean bag toss-Use a refrigerator box and cut out a candy corn, or make it out of wood for something you could use every year. Easy! 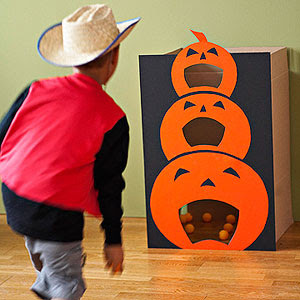 Or make a Pumpkin Bean Toss Game. 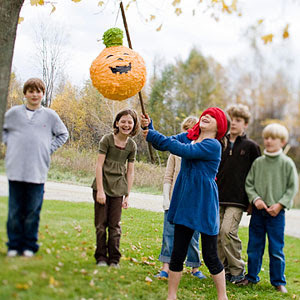 You use pinatas at birthday parties….why not at a Halloween party? 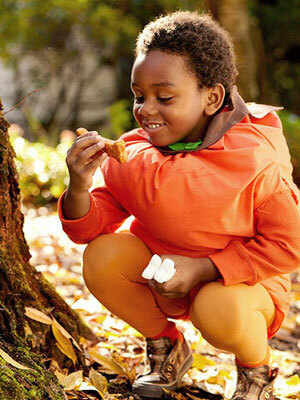 Halloween Smores would be so much fun! 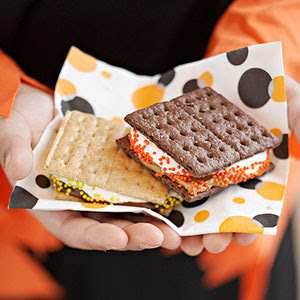 Use Halloween colored sprinkles and you’re set! It’s the awesome Mystery Box! 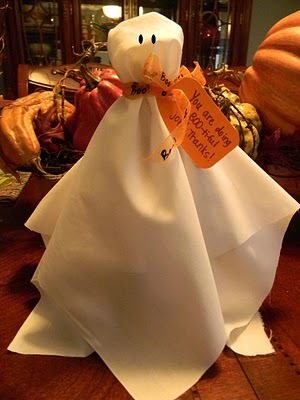 Put party favors inside or freaky Halloween surprises….either way it will definitely be a mystery. 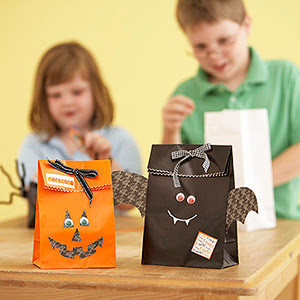 These darling treat bags are super easy to make and will make your Halloween prize/treats all that more special! This looks like another bowling game. I like how they wrapped up the basketball with gauze and added googly eyes. This is an oldie but goodie but still a very fun game for the kids. 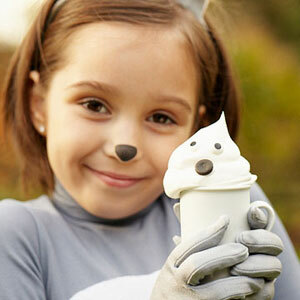 Bone-a-fied Scavenger Hunt This is a sweet game that the kids will really like. 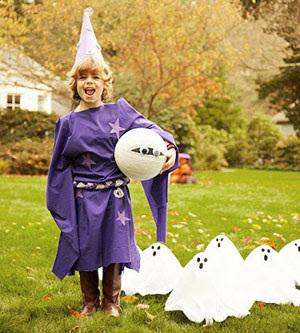 Halloween Balancing Act-Be sure to have Spiders….The kids wouldn’t want to fall off into the spiders!. 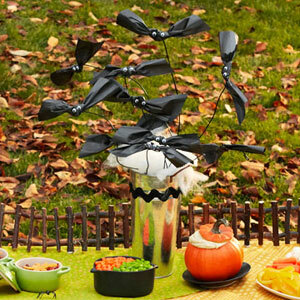 Not a game but a really cute and easy centerpiece. Sooooo Simple, I’m telling you. I know it’s going to be a cold night where I live on Halloween, and what could be better than a Ghostly Hot Chocolate? Use your wonderful imagination! How do you want to play it? Let the kids throw things into the buckets… (Spiders, bats, bones etc. get them at the dollar store) then add up the numbers on the buckets that he actually got something in. The one with the highest numbers wins the game?